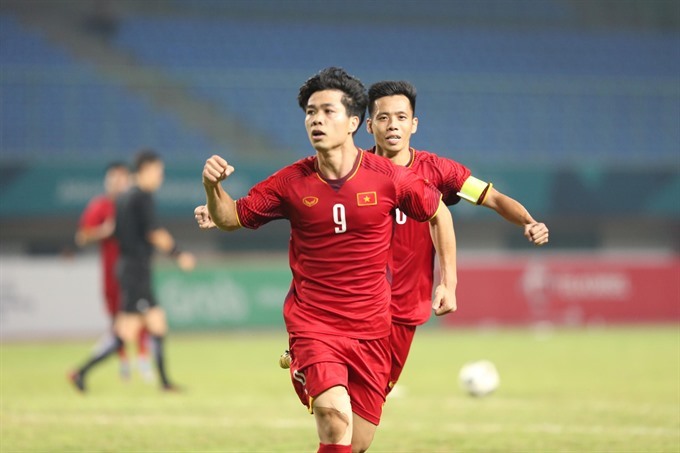 The Việt Nam Olympic team defeated Bahrain 1-0 in the last 16 of the men’s football at the Asian Games (ASIAD) 2018 in Indonesia on Thursday evening. Striker Nguyễn Công Phượng shone in the 87th minute to help Việt Nam enter the event’s quarter-finals for the first time ever. Việt Nam played with confidence from the referee’s first whistle. After receiving a pass from striker Nguyễn Văn Quyết in the fifth minute, midfielder Nguyễn Quang Hải nearly managed to score the opener for Việt Nam but hit the crossbar. Bahrain also played actively and created several dangerous situations around Vietnamese Dũng’s goal. In the 23rd minute, Bughammar Ahmed beat goalie Bùi Tiến Dũng but it was decided that the goal came from an offside position, and thus was disallowed. In the 38th minute, goalie Dũng managed a stunning save following a shot by Marhoon Mohammed. However, Bahrain’s midfielder Ahmed Sanad was issued a red card in the 42nd minute after a rough tackle against midfielder Vũ Văn Thanh. In the second half, Việt Nam continued controlling the game. Vietnamese head coach Park Hang-seo changed his tactics and players to seek goals but the team were still unable to capitalise on opportunities. After missing many chances, Phượng fulfilled Việt Nam’s dream with a goal in the 87th minute after collecting the ball from the right flank and finding the back of the net with a powerful shot. Earlier, Bahrain qualified for the last 16 as one of the third-placed teams of Group F, while Việt Nam secured three wins to top Group D.
Việt Nam will meet Syria in the next match on August 27.